You’ve gotta hand it to fondant frosting. It makes a gorgeous cake. It shapes like potter’s clay and holds color like a fresco. All those tilting, day-glo cakes you see that are so alluring—all fondant. Unfortunately, most of the cake’s engineering stops at decoration. The meat of the cake, so to speak, is bland and pointless. We’ve made sure our buttermilk cream Daisy Cake is different. It's baked with real butter, buttermilk, fresh lemon juice and real vanilla. After it cools, the daisy decorations are added by hand. They'll love how it looks. They'll talk for weeks about how it tasted. 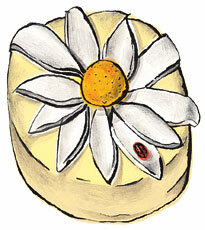 Cake is pastel yellow with a huge white and yellow daisy and a ladybug. Ships frozen, arrives cool, keep refrigerated.